Watch the short video below to find out more about what pension auto enrolment is. 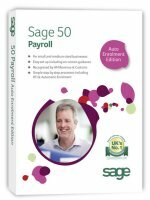 We also have some short videos about the new Sage 50 Payroll Auto Enrolment Edition of the software. To see the Sage 50 Payroll Auto Enrolment Edition videos click here. Order Sage 50 Payroll Auto Enrolment Edition by calling your Sage Accountant Partner, Site4, on 01257 460018 to order today.